With a location we fell in love with it really is one of the most relaxing and beautiful places we have ever seen. Polfages is an idyllic location for your holiday. 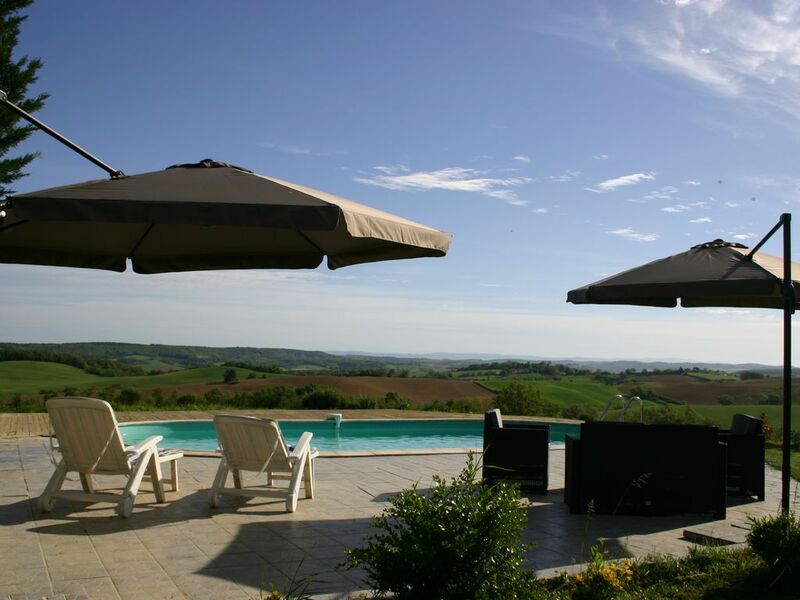 Situated overlooking rolling hills with views over to the Montagne Noir on one side and the Pyrenees on the other. It offers a holiday that can be both relaxing and action packed. Polfages is ideal if you just want to sit by the pool and relax taking in the stunning views or if you want to make the most of you time in the region. With the beach just over an hour away and the mountains the same you can truly get the best of both types of holiday. Mazamet is 1 of the 3 gites that we offer our guests, each of the gites are individual units allowing our guests their own private space. However one or all of the gites can be rented for larger parties allowing us to take groups of up to 14 people. The gites have been configured to allow large groups to be together during the day but have their own space if they want in the evening. Our gite Mazamet is made up of an open plan 1st floor with a well equipped kitchen and dining area and a comfortable lounge area. The lounge leads onto the terrace and BBQ area, where you can live the alfresco lifestyle whilst relaxing with the stunning views. You can access the garden and pool from the terrace. The second floor consists of 3 very large twin or double bed rooms. Each bedroom has an en suite bathroom. All the bedrooms are designed to the highest standard of comfort and with the extra space in each bedroom they are all both light and airy. Polfages is somewhere that my family and I think of as truly special. Every time I walk the dogs or just sitting and take in the views I realizes how lucky we are. From the views that stretch away into the forever distance to the clean pure air that comes from the stunning Pyrenees. Taking the in the silence of the countryside to watching the hawks spiraling upwards into the clear blue sky. We absolutely love Polfages and everything that this wonderful place brings. Our third family visit in three consecutive years and we will book again very soon for next year. Thank you Jo and Andrew and Jasmine and all the animals for another perfect holiday. This gorgeous place has so much to offer with its countryside location, great weather, 360 degree views, easy access to the sea and mountains, brilliant amenities and amazing hosts to name but a few things. We visited Ax-Les-Thermes which we would recommend as the drive itself is beautiful to the Pyrenees, and the thermal baths are well worth a visit. Our two sons (8 years old) enjoyed the hot baths, even though they couldn't dive bomb in them! We made another trip to Lac de Montbel which being only about 40 minutes away is a lovely lake to spend time on the beach and in the water. It is easier to drive to the North part than the South. Another day trip was to a lake just south west of La Cite in Carcassonne which is amazing for children with lots of inflatables, slides, zip wires and so much more. Definitely recommend going and will be returning next year for a full day and take a picnic. Belpeche is a lovely village nearby with a fab bakers and butchers and I am told you can canoe on the river from there. Mirepoix market is definitely worth a visit on a Monday as they sell absolutely everything! This is a quiet, rural location and you definitely need a car to explore, but as a family we cycled, walked and ran around the local area and this is probably our favourite area of France having visited quite a few over the years. There are lots of day trips to do in the area, of if you like sunbathing then the garden and pool are perfect and have the most amazing views. Thanks again to the Frith family and we miss Carmen, Rufus and Dipstick and the boys want to Facetime the dogs and cats!!! See you in 2018! Stayed over the weekend. The hosts couldn't do enough for us. Very friendly, helpful and welcoming. Food on arrival was excellent. The accommodation was home from home but warmer and with a pool. Quiet, peaceful location so would need a car to get there and to get around the area. We stayed at Polfage for 7 months and loved the accommodations, the environment and Jo and Andrew who introduced us to so many things and people. It was our first long term let in France, and left such an impression on us. Our dogs miss their dogs and our daily walks down the road with the view of the Pyrenees and the rolling hills, was incredibly wonderful. This was our second visit to Polfage, again in Gite Mazamet. Standard of the accommodation still very high, with a huge warm welcome form Andrew and Jo. Andrew has a great philosophy of 'our guests may only have 1 holiday a year, and if that's with us we need to get it right'. We love staying here! This year we went on trips to Ax les Thermes to the hot spring pools, Lac Montbel (hire an electric boat), car safari at Sigean (tip: go at 4pm when the animals have woken up), Space museum in Toulouse, Fontfroid Abbey. I can also highly recommend a visit to the inflatables at Carcassone Plage and a walk around the city walls at Carcassone Cite. On departure day we drove down to Girona via the Pyrenees which was amazing! Thanks to Andrew's friend for that tip! One of the prettiest locations we have found in our years visiting France, perched on a hilltop, surrounded by rolling countryside and mountain views to the North and South. We loved Polfages so much last year, that we immediately re-booked for summer 2016 upon returning to England, and will be booking flights and organising diaries for summer 2017 before someone else gets in there first. We absolutely love staying at Mazamet, and once again the place was beautifully clean, well decorated and stocked ready for our visit. The gite is so relaxing and calm, and we love the views from the bedrooms particularly waking up to sunshine coming through the shutters. It is very useful having three bathrooms, and all the rooms are a very good size with very comfy beds and lots of towels and everything required for a comfy stay. The kitchen has everything you need to cook every day, the children enjoyed the pizzas made by Andrew and Jo and especially the baking and puddings on offer. The weather was glorious we spent most of the week by the pool and in the garden, but we enjoyed our daily drive to Mirepoix for provisions, and we did drive to Lac Montbel one day to swim in the lake and sit on the beach, so well worth a visit and probably only 40 minutes’ drive from the house. Castelnaudaray is well worth a visit and the drive there is very pretty. My husband spent all week cycling and hired his bike from a local company which for the second year has been excellent with the bike being dropped off and picked up from the house. Andrew was very kind again to take delivery of this for us on the day before we arrived. We didn’t do as many day trips this year, but Carcassonne is lovely, as well as Narbonne and a trip to the Plage. We watched the Medieval procession in Mirepoix which was very authentic, and some amazing costumes, music and street acts. The boys loved meeting Dip Stick and talked about nothing else for the last year but Carmen and Rufus and Sebastian (please get another guinea pig before next summer?! ), as well as wanting to see Andrew and Jo again and take advantage of their wonderful hospitality. Andrew and Jo are so welcoming and helpful and nothing is too much for them, to ensure you enjoy your stay in their beautiful home. We can’t wait until 2017 when we can return again. We stayed in Pol-Fages for a couple of days on our way back home from Spain. It was our first time in the area. We were welcomed by Jo, Andrew, their daughter and three lovely dogs. They became our children's (5 and 7) best friends. The house was really welcoming and very spacious for a family of 4. It was fully equipped and clean linnen/towels were provided by our hosts. Dinner was provided on our first evening. The home-made pizza's were delicious! Andrew also insisted to make us a Belgian dish on the eve of our national holiday and it was fantastic. He really is a great cook! We were given a folder with a lot of information on the area and a lot of visiting-tips. They were very handy. Pol-Fages is really beautiful. The view at the back of the house is amazing! The boys really enjoyed running around the big garden and playing in the swimming pool. In the meantime, we could relax and enjoy the view. Pol-Fages will definately be an annual stop when we pass through France!